For whatever reason the baking bug has got me. And it’s producing some pretty epic recipes, like this. I’m fairly certain pub cheese is universally adored, but in case you don’t know: Pub cheese. Is. Amazing. 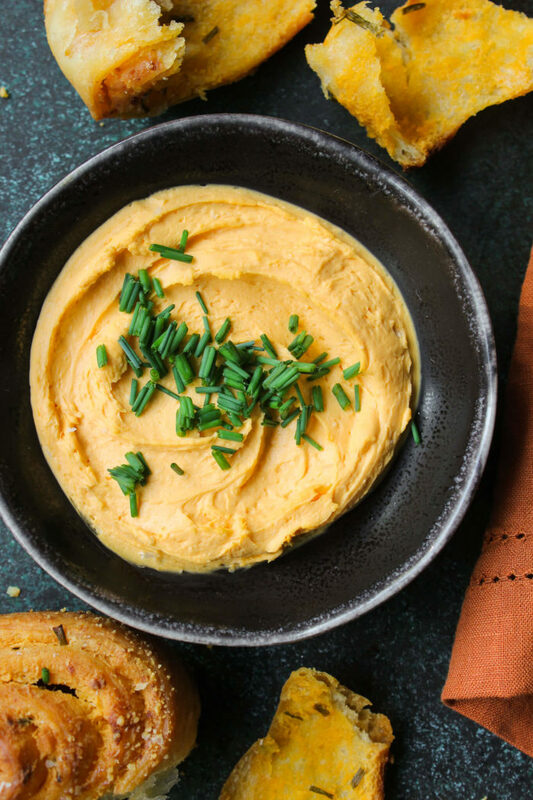 It’s a spreadable, mousse-like cheddar cheese dip that goes with EVERYTHING. And as I found out, it works great stuffed inside a dinner roll. You start by preparing a basic bread dough, which is a simple combination of milk, butter, eggs, yeast, flour, and seasonings. To the novice baker I realize this might sound complicated, but trust me — It isn’t. If this is your first time baking bread I suggest you take your time, read the directions slowly, and don’t be afraid of messing up! If you do happen to make a mistake (you won’t!) it’s all just part of the process. Once the dough has formed let it rise for 30 minutes, then get back to work. On a floured surface roll out the dough into a giant, flat sheet, then warm the pub cheese in the microwave for 10 – 15 seconds. Use an off-set spatula to spread the pub cheese all over the dough, coating in a thick, even layer. 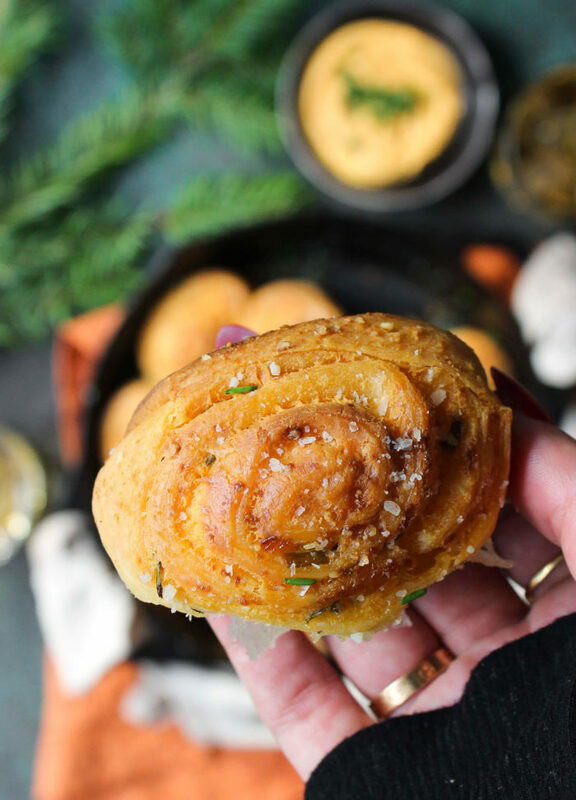 Sprinkle with diced chives, then roll everything up into a tight, fat log — This recipe is handy for step-by-step visuals. Lastly use a pizza cutter to slice the log into even, swirly rounds, then arrange inside a greased baking sheet! 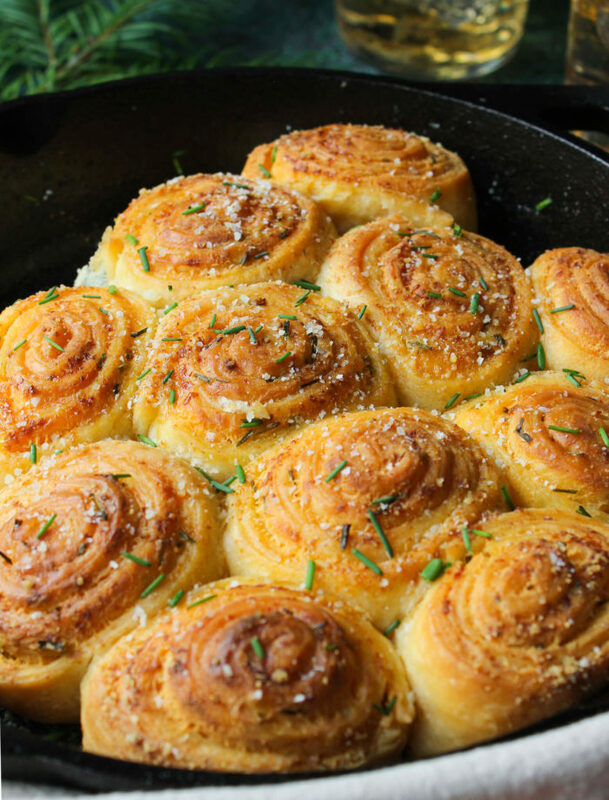 One look at those delightful spirals and you’ll start to feel giddy all over. Leave some space between each round so that you can coat the sides of the dough with olive oil, then sprinkle with parmesan cheese. Bake for about 30 minutes until flaky and golden, then get ready to CELEBRATE. Not only do these look gorgeous, but they taste incredible too. 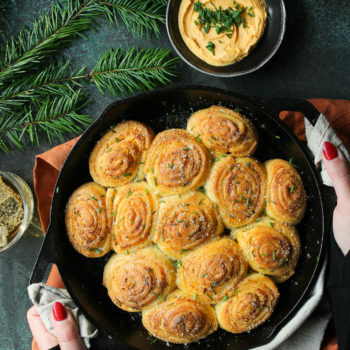 Flaky, buttery, and stuffed with herbaceous cheese, this is a major-league dinner roll that’s fittingly epic for the Christmas season. 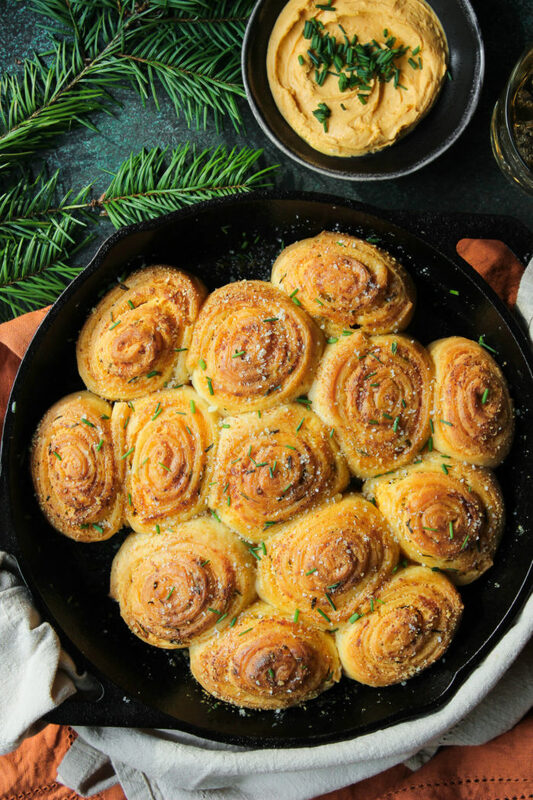 Bake them for Christmas dinner, serve them as an appetizer on Xmas Eve, or bring them to any holiday potluck! Begin by preparing the dough. In a small saucepan warm the milk over a low flame, then add in the butter to melt, stirring occasionally. Once melted, transfer to large mixing bowl and add the sugar and salt. Let this mixture cool slightly, then add in the eggs and whisk until smooth. Lastly incorporate the yeast, garlic & onion powders, and flour, stirring until the dough takes shape. Knead the dough inside the mixing bowl for several minutes, then cover bowl with saran wrap and allow dough to rise until approximately double in size, about 30 minutes. The dough is ready when you can press your finger into it and the indentation remains. Pre-heat oven to 350F. Amply grease a 10″ or 12″ circular baking dish with shortening. Once the dough has risen, turn the dough ball onto a heavily floured work surface. Using a rolling pin roll out the dough into a thin, even sheet about 1/8″ thick — It will be pretty large, don’t worry! Next, warm the pub cheese in the microwave for 10 – 20 seconds until easily spreadable, then spread over the rolled-out dough, using an offset spatula for smooth, even results. Sprinkle with the diced chives. When ready, roll the dough into a tight, fat log — this post shows you how! Take your time here, and don’t worry if the ends aren’t entirely even — You can discard them later. Once rolled, use a pizza cutter to cut the dough into even-sized rounds. Transfer the sliced rounds to the greased baking dish, arranging them swirl-side up with a tiny bit of room between each. I discard the uneven ends of my log that are mostly dough, but you can bake yours if you’d like! 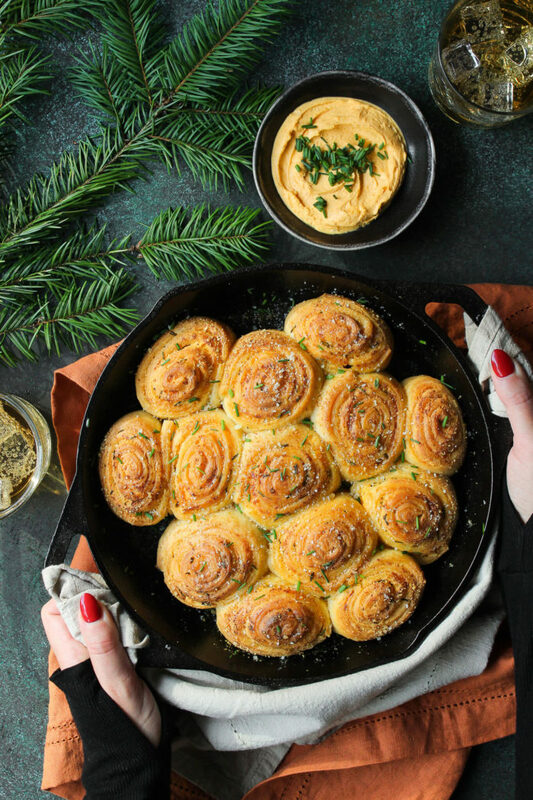 Use a pastry brush to coat the sides of each round with olive oil, then sprinkle with grated parmesan and bake on oven middle rack for 30 – 35 minutes until golden and cooked through. Cool for ten minutes, then EAT!